It all started in 2002. The Columbus Blue Jackets held the third overall pick of that draft. Thanks to a trade with the Florida Panthers, the Blue Jackets got the first overall selection. With that pick, they selected Rick Nash. Why does this selection matter now? That’s because an eventual trade of Nash has a direct result on who is now on the current roster. Nash was the centerpiece of a trade to the New York Rangers that saw the Blue Jackets receive Brandon Dubinsky, Artem Anisimov, Tim Erixon, and a 2013 first-round selection. The Blue Jackets selected Kerby Rychel with that pick. It is these kinds of transactions that shape who is on the team now. As it turns out, decisions made several years ago still have an influence today. We will take a look at the current roster and see how they arrived in Columbus. A total of eight players are on the roster as an original draft pick of the Blue Jackets. In chronological order, those players are Cody Goloubef (37th overall in 2008), Matt Calvert (127th overall in 2008), Cam Atkinson (157th overall in 2008), Ryan Johansen (4th overall in 2010), Dalton Prout (154th overall in 2010), Boone Jenner (37th overall in 2011), Ryan Murray (2nd overall in 2012), and Alexander Wennberg (14th overall in 2013). All other members of the team came as a result of trades and transactions. The Blue Jackets acquired Saad in a seven-player deal. Going to the Blackhawks were Anisimov, Marko Dano, Corey Tropp, and Jeremy Morin. How did the Blue Jackets get these pieces? As mentioned above, Anisimov was part of the Nash trade. The Blue Jackets drafted Dano 27th overall in 2013. The Blue Jackets acquired this pick as part of the trade that saw Jeff Carter go to Los Angeles. Nice to see something positive come from that situation. Columbus claimed Tropp off waivers in November 2013 after the Buffalo Sabres released him. Morin came to Columbus this past season in the Tim Erixon deal. Erixon is now a member of the Pittsburgh Penguins. The Blue Jackets acquired Foligno straight up for Marc Methot on the first day of free agency in 2012. Methot went 168th overall to Columbus in 2003. This pick was acquired from the Carolina Hurricanes. The Blue Jackets sent a fourth-round pick in 2004 (Kris Hogg) to Carolina for a fifth-round pick in 2003 (Arsi Piispanen) and a sixth-round pick in 2003 (Methot). The Blue Jackets now have their captain in part as a result of that trade. Who knew? 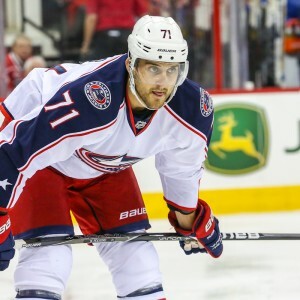 What seemed like a meaningless trade of draft picks eventually led to the Blue Jackets landing a captain in Nick Foligno. One of the biggest trades of last season was when the Philadelphia Flyers sent Hartnell to the Blue Jackets in exchange for R.J. Umberger and a draft pick. This was Umberger’s second stint with the Flyers. The first time ended when the Flyers sent Umberger to Columbus in exchange for two draft picks, a first and a third in 2008. The first-round pick was originally a conditional pick. 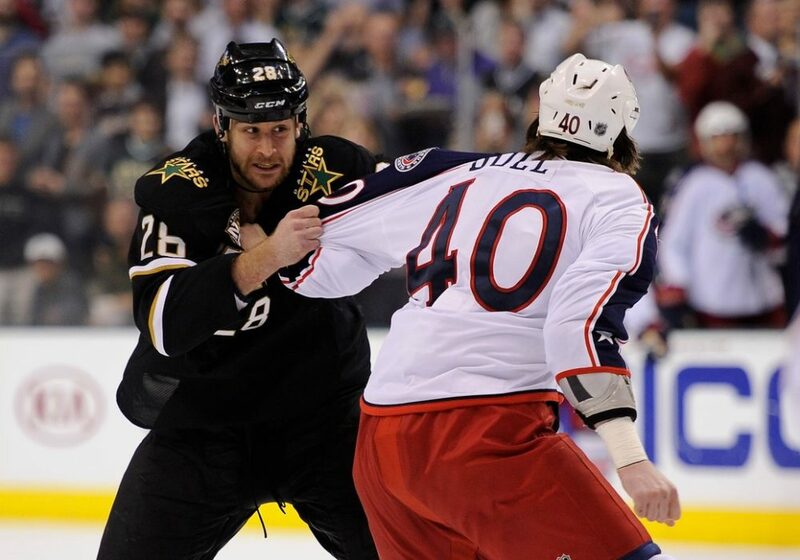 The Blue Jackets acquired this pick as a result of a trade that sent their former captain Adam Foote back to Colorado. If the Avalanche made the playoffs that season, which they did, the pick became a first rounder. In perhaps one of the more surprising trades of last season, the Blue Jackets traded Nathan Horton to the Toronto Maple Leafs in exchange for Clarkson. The Leafs wanted badly to dump Clarkson’s contract. The Blue Jackets were holding dead money in Horton thanks to an awful health situation. Both sides made the best of a bad situation. 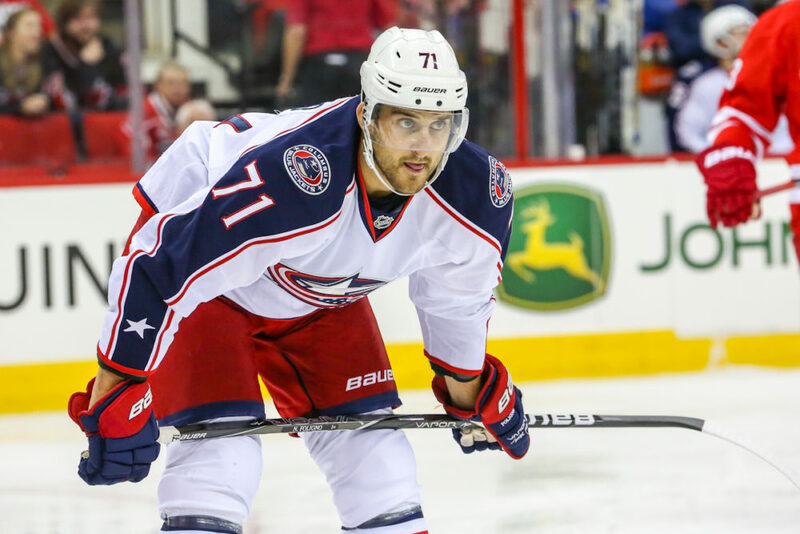 The Blue Jackets signed Campbell as a free agent this summer to replace Mark Letestu as their fourth-line center. The Blue Jackets acquired Bourque along with William Karlsson and a second-round pick in the James Wisniewski deal. Wisniewski’s rights were dealt to Columbus from Montreal in exchange for a conditional draft pick. That pick turned into a fifth-round pick after the Blue Jackets signed Wisniewski to a $33 million contract. The pick turned into Charles Hudon. The Blue Jackets selected Jared Boll with the 101st overall pick in the 2005 draft. The pick originally belonged to the Maple Leafs. Carolina then traded Ron Francis (yes, him) to the Leafs in exchange for this pick. Then the Leafs traded this pick to the Blue Jackets in exchange for Derrick Walser and a fourth-round pick in 2006 (which turned into James Reimer). Now you can impress your friends when you mention how Francis, Reimer, and Boll are forever linked. The Blue Jackets acquired Tyutin as part of a deal that saw them send Nikolai Zherdev and Dan Fritsche to the New York Rangers. Zherdev was the fourth overall pick in 2003. Fritsche was the 46th overall pick in 2003. The Blue Jackets acquired Jaroslav Spacek and the 46th pick in exchange for Lyle Odelein. Johnson was the centerpiece return in the deal that saw Jeff Carter go to Los Angeles. Thanks to Marko Dano, it helped the Blue Jackets land Brandon Saad. The Blue Jackets selected Savard with the 94th overall pick in 2009. This pick was a conditional pick. Another part of the Foote deal to Colorado was this conditional pick. As long as Foote re-signed with the Avalanche, this pick became a fourth-round pick. So the Foote deal helped the Blue Jackets land both Hartnell and Savard. That’s a nice return. The Blue Jackets claimed Connauton off waivers from the Dallas Stars this past season. 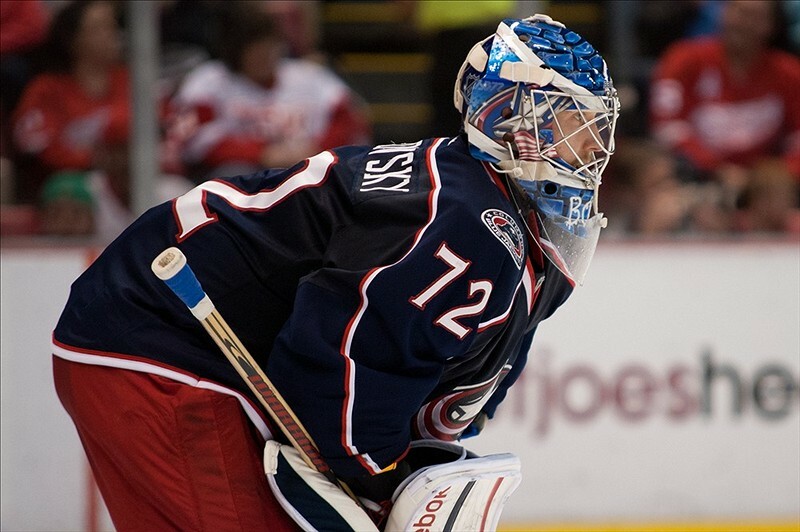 The Blue Jackets acquired Bobrovsky for three draft picks, including a second and two fourths. The second-round pick and one of the fourth-round picks belonged to the Coyotes. The Blue Jackets acquired those picks as a result of the Antoine Vermette deal. That deal saw Vermette go to the Coyotes, while the Blue Jackets got Curtis McElhinney and those two draft picks (a second and a fourth) in return. Vermette had a direct hand in bringing both current Blue Jackets goalies to Columbus. There you have it. This is how the Blue Jackets roster came to be. Need more Blue Jackets content? We got you covered. Rob Mixer brings us his 11th installment of Mixer’s Mailbag. Make sure you ask him who the best golfers on the team are. He’ll succumb to pressure and change his answer multiple times. A pair of podcasts recently came out. Check out BS Hockey’s and The CBJ Artillery’s latest. Cannonfest is coming. Katie Foglia spoke to Alison Lukan about what’s coming this year. The Columbus Dispatch previews the upcoming season for Brandon Dubinsky. And finally, Matt Wagner of the CBJ Cannon has an offer for you about Brandon Saad you cannot refuse.